From blind-spot monitoring and backup cameras to lane-departure warning, collision warning and everything in between, advanced driver assistance systems (ADAS) represent a billion-dollar opportunity in the mobile-electronics segment of the automotive aftermarket industry. Mobile-electronics products were well represented at the 2017 SEMA Show. The following is a collection of products that were on display in the New Products Showcase last year, along with commentaries by industry experts. Get quick power in five minutes—more than 44 hp and 65 lb.-ft. of torque. The aFe Power Scorcher blue power module alters pressure sensor signals to increase boost throughout the entire rpm range. 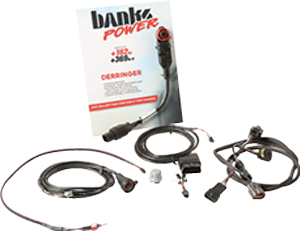 That increases performance and provides quicker throttle response and reduces turbo lag. Bluetooth connectivity to iOS or Android devices for on-the-fly adjustment and enjoyment. Throttle-body EFI designed exclusively for I-6 Jeep and Toyota engines. Featuring OBD-II diagnostics, electronic returnless fuel delivery, Bosch 4.9 wideband O2 available, CAN bus gauges, electric fan control, ECM-controlled spark advance, drive-by-wire capabilities, end-user tunable and underhood industrial-level ECM. This full replacement A-pillar trim cover allows for seamless integration of AutoMeter gauges into the interior of both the ’15+ F-150 and ’17+ Super Duty. Made in the U.S.A. from high-quality composites, it drastically simplifies the process of installing instrumentation in these two incredibly popular trucks. The new Re-Start lithium-ion starter batteries from Antigravity Batteries are the first starter batteries with onboard jumpstarting. If the battery is over-discharged, the press of a button re-starts the vehicle. No more being stuck in the middle of nowhere because the lights were left on. Just reset and drive away. The RTL-S comes with integrated flashing amber turn signals for higher visibility and performance off-road. This product features a running light, brake light and white work/cargo light, making this bar a must for all off-road enthusiasts looking for extra safety in style. The LP9 utilizes nine forward-projecting LEDs to produce 11,025 lumens and six LEDs for Integrated Peripheral Technology, producing 1,140 lumens per side and a massive 200-in. spread of usable light. Baja Designs has integrated a daytime running light low- and high-power feature while minimizing high temperatures with its Direct Ducted Cooling air passages. Adds the ability to monitor EGT to the iDash 1.8 SuperGauge. Allows for data logging of EGT parameters. Requires Banks iDash (sold separately). Six on-the-fly power levels include a Sport mode, adding a blistering +57 hp/+78 lb.-ft. plug-and-play system. Connects to included iDash 1.8 digital display for the ultimate in information and power selection. ActiveSafety provides safe/intelligent power. Check and clear codes. Six on-the-fly power levels include a Sport mode with Full-Power Enrichment function, adding a blistering +40 horsepower/+63 lb.-ft. plug-and-play system. Connects to included iDash 1.8 digital display for the ultimate in information and power selection. ActiveSafety provides safe/intelligent power. Check and clear codes. Three on-the-fly power levels include Sport mode to a blistering +162 hp/+369 lb.-ft. for fast 0–60. Easily concealed tuner is a plug-and-play microcomputer designed for simple installation. Connect to the iDash 1.8 for more level options. ActiveSafety provides safe/intelligent power. Six on-the-fly power levels include a Sport mode, adding a blistering +79 hp/+92 lb.-ft. plug-and-play system. Connects to included iDash 1.8 digital display for the ultimate in information and power selection. ActiveSafety provides safe/intelligent power. Check and clear codes.